Problems on Volumes : Aptitude Test pdf free download . How Problems on Volumes : Aptitude Test pdf free download useful? Problems on Volumes : Aptitude Test pdf free download are very useful in all the kinds of competitive examinations from Clerk level to Officer level. These tests will assess the individual's computational capabilities which are useful in the day to day work in Banks, Insurance Companies, LIC AAO and other government offices. Here you will practice and learn All Problems on Volumes : Aptitude Test pdf free download Questions along with Explanations (Questions with Answers) which will improve your Computer skills required for Competitive exams. The Problems on Volumes : Aptitude Test pdf free download are questions and Answers are given in all the Bank, Insurance Examinations like SBI PO, SBI Clerk, IBPS PO and Clerk, RRB Grameen Banks, RBI Assistant and Grade B Officers, LIC AAO, UIIC AO, NICL AO and other State and Central Government examinations like SSC CGL and CHSL, FCI, Groups, Police SI and Constables, CDS, NDA, SCRA Railway Apprentice Exams, RRB NTPC). How to Download Problems on Volumes : Aptitude Test pdf free download Question and Answers with explanations? IndianStudyHub is providing all Problems on Volumes : Aptitude Test pdf free download questions and answers along with detailed explanation and Answers in an easy and understandable way. The Answers are explained in elaborated manner to get clear subject knowledge. Basic and Fundamental Problems on Volumes : Aptitude Test pdf free download Questions? You will be able to solve all kind of questions based on Problems on Volumes : Aptitude Test pdf free download by practicing exercises given in this Problems on Volumes : Aptitude Test pdf free download section. How to get Shortcut key for Computer Awareness and Problems on Volumes : Aptitude Test pdf free download Questions? One can get all the shortcut key explained in a detailed manner in Problems on Volumes : Aptitude Test pdf free download. Why Problems on Volumes : Aptitude Test pdf free download ? Where can I get Problems on Volumes : Aptitude Test pdf free download questions and answers with explanations? IndianStudyHub offers many fully Problems on Volumes : Aptitude Test pdf free download questions and answers with explanations. examples with detailed response description, explanation is given and it would be easy to understand. You can see the explanation for the questions of sensation and a good user interface. 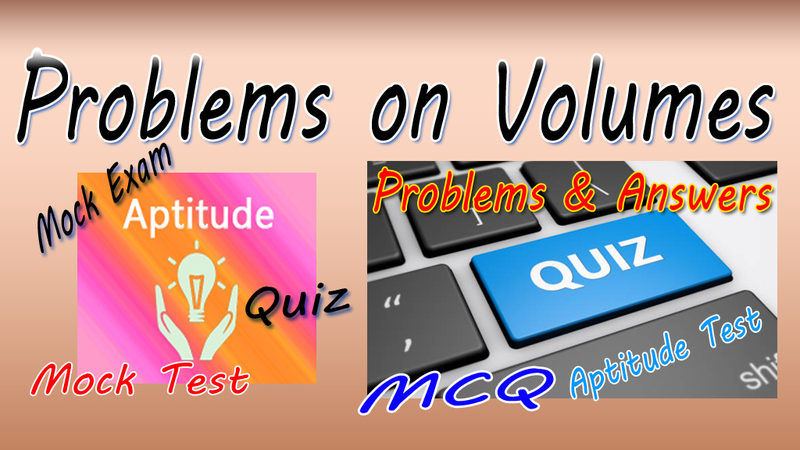 How to solve Problems on Volumes : Aptitude Test pdf free download questions? You can easily solve all kind of questions based on Problems on Volumes : Aptitude Test pdf free download and Computer Awareness by practicing exercise given in this Problems on Volumes : Aptitude Test pdf free download section. 1. The side of a cube is 8 m, Find the voiume? 6. The surface area of a cube is 486 Cm3. Find its volume? Let each edge of the cube be a Cm. 12. The lateeral surface area of cuboid length 12 m, breadth 8 m and height 6m. To whom this Volumes in Mensuration Question and Answers section is beneficial?